Copper’s Collapse Deepens as Trump Escalates Spat With China | Beckett Bronze Co., Inc.
Beckett Bronze manufactures bronze bearings, bronze bushings, and bronze bars. Custom made cast bronze bearings, bushings, and bars are made from over 50 alloys in our own foundry. 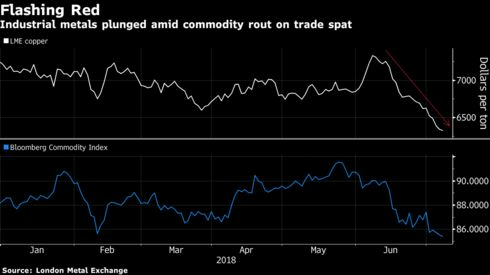 Copper’s flashing a powerful warning about expectations for global growth as the trade war between the world’s two biggest economies escalates. Prices have lost more than $1,000 a metric since closing at a four-year high on June 7 and are at the lowest in almost a year. Copper fell with most metals Friday as President Donald Trump slapped tariffs on $34 billion of Chinese imports, prompting the Asian country to retaliate in kind. Copper fell 0.8 percent to $6,293 on the London Metal Exchange, heading for the biggest weekly slump since 2015. Prices are down 13 percent this year. Metals have performed badly in recent weeks, with zinc entering a bear market, on concern that the litany of trade disputes initiated by Trump will escalate and harm the global economy. In the run up to today’s tariffs, Bank of England Governor Mark Carney said the rise of protectionism will hurt trade flows, push up import costs, and impact confidence, investment and demand. The yuan’s recent slump and signs of deteriorating sentiment in China have also contributed to copper’s slump, but by year-end tighter supplies should help prices rebound, ABN Amro’s Burgering said. “Over the summer, prices will remain very volatile and I don’t see any uptick in the next few months, but by the fourth quarter the fundamentals will take control again,” he said. If conditions deteriorate dramatically in the Chinese market, authorities there will look to stimulate the economy to prop up growth, analysts at BMI Research said in an emailed note. While that’s unlikely to increase infrastructure spending directly, it would support economic growth and therefore metals demand, they said. Lead, nickel and tin declined Friday, while aluminum and zinc were little changed. On Thursday, the LME’s metals index dropped to the lowest since August 2017. 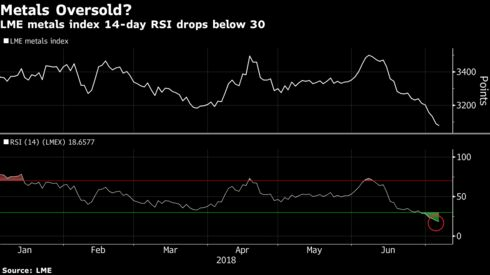 The gauge’s 14-day relative-strength index is well below 30, a signal to some chart watchers that prices could be poised to rebound.